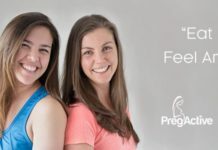 Post-Baby Workshop Chirnside Park - A Trusted Women's Health Physio! Let’s Re-Gain Your Body Confidence! *We had another amazing workshop on the 24th, stay tuned for more future dates. Are you ready to re-gain your body confidence? Stop unwanted leakage? Know how to start healing your diastasi recti the safe way? And recover from post-birth the right way with safe postnatal exercises? When you attend our post-baby workshop, you will gain access to the tools, practices, exercises and resources you need and deserve to improve your health and wellbeing as a mother. Our post pregnancy workshops are highly interactive. This provides you with the opportunity to ask lots questions and get the answers you want. Our workshops provide a supportive and welcoming environment for all women. You deserve to feel good in your body again. It is important that you re-gain your body confidence to take on motherhood. This is your step to regaining control, feeling energised again and being the happier, healthier mother you want to be. Learn from a Women’s Health Physio exactly what diastasi recti is all about. Learn how to check for diastasis recti. Heal your belly the medically recommended way. Discover the best exercises to do when you have abdominal separation. Learn how to rebuild a connection with your body. Be empowered to make positive change! Discover the exercises you must avoid during this post-baby period. Learn how to re-gaining trust in your body again to function how you want it to! Find our how to re-gain your body confidence. Learn how to restore your core & optimise your pelvic health. Learn how to activate your pelvic floor and gain a functional pelvic floor. Learn about intra-abdominal pressure and the affects it can have if you do not have a functional core. Learn how to feel great again and take on motherhood with increased energy. Learn how to do a self check for diastasis recti, and have yours checked by a women’s health physiotherapist on the day. 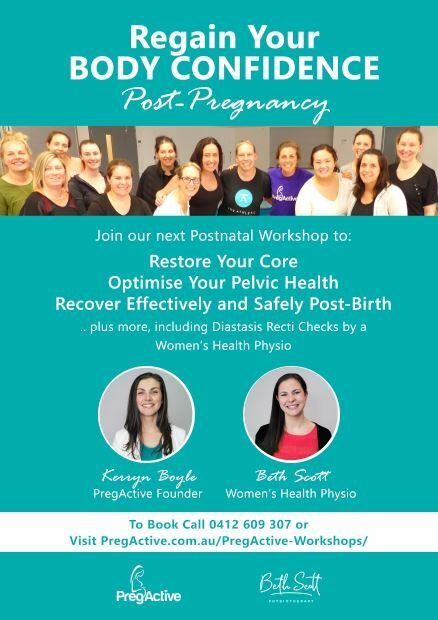 This workshop is hosted by PregActive Founder and Postnatal Exercise Specialist Kerryn Boyle along with Women’s Health Physiotherapist Beth Scott. 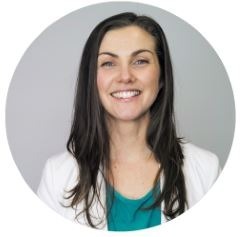 Kerryn is the Founder of PregActive and one of Australia’s leading Prenatal and Postnatal Exercise Specialists. Kerryn teaches in-studio classes and helps new mothers re-gain their body confidence. Beth Scott Beth is passionate about helping pre and postnatal women achieve their health, body and fitness goals. 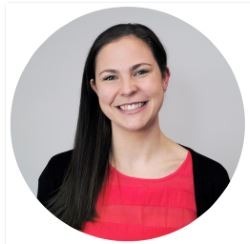 Beth regularly sees women who are experiencing lower back, pelvic, and pubic symphysis pain, as well as DRAM (diastasis of the rectus abdominal muscle). To join us for this post-baby workshop, please send me an Email and I will be in touch with more details. PS: We’re offering the final few seats at a very Special Price be sure to CONTACT US to get your discounted price and save! For other payment options, contact us.